When working with Exchange I sometimes come to clients who already have a hybrid exchange configured environment. In many cases this is when the hybrid configuration does not work. To make things easier for myself, I created an overview that eliminates the pain of firewalls and networks. To help you guys out in these situations i share my ports overview document with you, The document is mentions as a cheat sheet this means that you can adjust it and present it to the customers network team. If you do not have an external IP use the external IP of the autodiscover. Click here to read other posts for more Exchange related posts. Oms (Microsoft Operations Management Suite) is Microsoft’s cloud-based IT management solution that helps you manage and protect your on-premises and cloud infrastructure. In this case we will use OMS to monitor and sort of “manage” Azure AD connect and Azure AD identities. Bore we start there are some requirements. We need a Valid OMS Subscription – OMS has different level of subscriptions. It is depending on the OMS services you use and amount of data you uploaded. Ther is a free version which provides 500mb daily upload and 7-days of data retention. 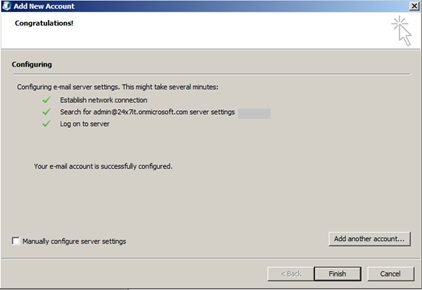 Domain Administrator Account in order to install the agent in the domain controllers we need to have Domain Administrator privileges. By default, AD Assessment solution is enabled. In order to enable AD Replication Status click on the tile from the solution list and then click on Add. Next step of the configuration is to install monitoring agent in domain controllers and get them connected with OMS. 3. Go to Settings > Connected Sources > Windows Servers > click on Download Windows Agent (64bit). it will download the monitoring agent to the system. 4. Once it is download, double click on the setup and start the installation process. 5. In first windows of the wizard click Next to begin the installation. 6. In next window read and accept the licenses terms. 7. In next window, we can select where it should install. If there is on changes click Next to Continue. 8. In next window, it asks where it will connect to. In our scenario, it will connect to OMS directly. 9. In next window, it asks about OMS Workspace ID and Key. 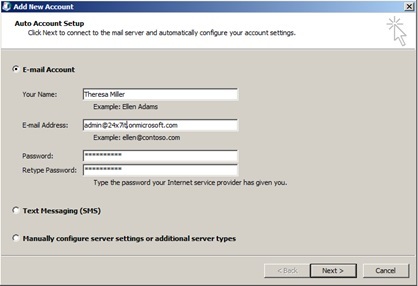 it can be found in OMS portal in Settings > Connected Sources > Windows Servers. if this server is behind proxy server, we also can specify the proxy setting in this window. Once relevant info provided click on Next to continue. 10. In next window, it asks how I need to check agent updates. It is recommended to use windows updates option. Once selection has made, Click Next. 11. In confirmation page, click Install to begin the installation. 12. Follow same steps for other domain controllers. After a few minutes, OMS will start to collect data and virtualize the findings. To view this data, log in to OMS portal and click on relevant solution gallery tile in home page. You will find your analysed/ assessed servers there. You also get a quick overview and some recommendations for these servers. 3. In the box, you can search for the relevant log file name and add it to the list. We also can select which type of events to extract. Once selection is made click Save. After few minutes, you can start to see the events under log search option. In their using queries we can filter out the data. Also, we can setup email alerts based on the specific events. Often when you migrate users to Office365 you need to configure permissions for Shared Mailboxes. Bellow you find a small instruction on how to do this. Import the session with the variable set in previous step. Now you are connected to Exchange online with powershell. After you create a shared mailboxes, you have to assign permissions to all users who require access to the shared mailbox. Users can’t sign in to the shared mailboxes. They have to sign in to their own mailbox and then open the shared mailbox to which they’ve been assigned permissions. Here’s how to use PowerShell to create and configure a shared mailbox for the Corporate Printing Services department at Contoso Corporation. Create a security group for the users who need access to the shared mailbox In the Exchange Control Panel, create a security group for the staff who need access to the shared mailbox for Corporate Printing Services. Select My Organization Exchange> Users & Groups > Distribution Groups > New. Specify a display name, alias, and e-mail address. In this example, we’ll use Info, Companygroup, and Info@yourdomain.com. Select the Make this group a security group check box. In the Ownership section, click Add to add an owner, if necessary. In the Membership section, click Add. In the Select Members page, select the users you want to add. When you are finished, click OK.
On the New Group page, click Save. Note After you create a security group, the membership is closed. When membership is closed, only group owners can add members to the security group, or owners have to approve requests to join the group. Additionally, only group owners can remove members from the security group. Sometimes it happens that you need to create Bulk subsites in a Sitecollection. And there is one thing what it-ers don’t like and that is manual work. With this PowerShell script you can use a EXCEL.CSV to import as many sites as you want. First of all you need to install the SharePoint2013 Client Components SDK. The next step is to start up powershell ISE as a Administrator. 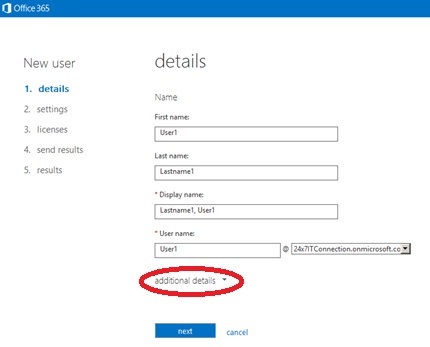 Fill in your Office365 administrator credentials and press OK.
Now you are connected to you SharePoint tenant. And we can start editing the script to import the CSV. Copy the following script in your Powershell script pane. Now you probably wonder what you need top fill in at Template. You can choos a custom template or you can choose one of the template from the site bellow. In the next couple of days i will create another blog about this subject where i show you how to create a Custom template and how you can get the template code of your custom template. Good luck and don’t hesitate to ask me question about this subject. Connect to your SharePoint Online tenant with the SharePoint Online Management Shell. When the Sharepoint online management shell is open and the module is imported we want to connect to our Tenant. Office 365 band SharePoint Online continues to develop and grow this means there are updates coming out everyday, week or month. Microsoft offers the ability to turn on ‘Preview Features’, Preview Features are the latest changes that haven’t been released yet. So How do I enable the preview features? Click Settings, scroll most of the page down and you will see a section called ‘Preview Features’ . Once done the latest Preview features should be available to you. You can also enable the preview features of Office365. This will enable lots of preview feutures like (Sway, Delve, and office 2016). To enable these go to your admin tentant (https://yourtenant-admin.sharepoint.com). Next klik on service settings and select updates. Now you have the option First Release. You can set this on entire company or you can set up a couple of super users to test with the preview features. Microsoft has recently added the Video portal to Office 365. Once created you can now upload videos and share with your Security Groups, SharePoint Groups or even unauthenticated users(everyone). If you have some movies you can also use Sharegate to migrate you movie files to the Microsoft Video portal. For more information you can check this blog From Jasper Oosterveld about Next gen Portals. You can also check this Blog of Benjamin Niaulin. In our last blog i showed you how you can migrate content between site collection. For my test migrated some content from a users OneDrive to a Site collection of the department the user was in. When i provided him with the information of the location of his content he notified me that he wasn’t able to see any of his content or documents. So the first thing i thought ok probably the rights. But the thing was that the user created a subsite in his department where i had put his content. This means that the user is Site owner of that site. Then i realized we migrated his data from his OneDrive where only he had access to so i probably had to set the rights on the folders and content i had migrated. Check permissions with the Sharegate Security and Management feature. Go to Sharegate and select security. You will see the following options. Press View to view the Permissions of that moment. To set rights with the Sharegate security an management tool go to security and select add permissions. Again select the user or group which you would like to give permissions. I did this because i have one user who doesn’t have rights on his own migrated folder. Then press apply to set the permissions that’s it. This feature i really dummy proof when you want to give easy permissions. Now you don’t have to got to the site, list or library to give permissions. There are several ways to run projects. The way i explain this is a proof of concept what i recommend for my customers. First of al you select the site collection where you will manage your projects. I recommend the that you create a new (private) site collection (https://yourtentant.sharepoint.com/sites/Projects). As site collection you choose Publishing Portal. After you created the site collection you wil be guided back to the site collection overview. It kan take some time untill the site collection is provisioned. When you start setting up your project page. i recommend you give every project a subsite. When you do this every project wil get the following apps. The engineer or technician can synchronize that one project where he is working on. When he uses this feature he will have all the information he needs to work on this project. To build a subsite go to the site collection you just made and select the little kamrad and select Content from site. In this site collection you start with a creating a subsite. This subsite needs to be a project site. When you start to create project subsites remember you always create the subsites under the Project site collection. The fun part is that you can really start to collaborate with your team on projects. For example you can create tasks and sync them with you project team. When you do this the tasks of that project site will also be shown in you Outlook. another nice feature is that you can open the Timeline on the SharePoint project site with Microsoft Projects. When you use this you can easily add resources en tasks to the Projects SharePoint site. If you have any questions please leave a comment bellow! 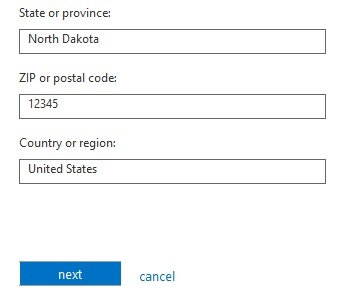 Creating a mailbox in Office 365 involves signing into your Office 365 account. The following steps assume your organization has already signed up for Office 365 through the MicrosoftOffice 365 Fast Track enrollment website. 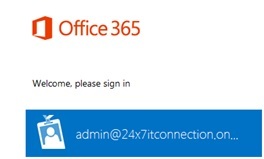 1) Sign in to your Office 365 portal at http://portal.microsoftonline.com. 2) Click Go to Users and Groups. 3) Click the + sign to add a new user. 4) Fill in the appropriate details for the user being added. See the following example then click on Additional Details. 5) Fill in the appropriate details for the user being added. See the following example and click Next. 6) Determine if the user will be an administrator. If yes, choose the administrator type. Here are some detail to assist with the correct selection. Billing Administrator – Helps make purchases, manage Office 365 subscriptions, oversee support tickets and monitor service heath. This role will not be available if Office 365 was not purchased directly through Microsoft. Global Administrator – Will give access to all administrative features. Note the individual that enrolls Office 365 for your organization will also be a global administrator. Password Administrator – Applies to those individuals that will need to reset a password, manage service requests, and monitor service health. This is great for a Helpdesk or an organization’s Security Administrators. Service Administrator – This role is great for managing service requests and monitoring service health. Also note, before this role can be assigned to a user, they much first have admin access to a service such as Exchange Online. User Management Administrator – Another great option for help desk or security administrator access this role allows them to reset passwords, monitor service health, manage accounts, groups and requests. This role is unable manipulate other administrator accounts or create admins’ roles. 7) For this example we are creating a Global Administrator in the United States. An alternate email address must be specified, then click Next. 8) Choose the appropriate licenses the account will need. This link provides better insight into the many licensing options. For this example we will choose all the products available within the Enterprise plan. Click Next after making the selections. 9) Provide an email address to email up to five users the temporary password for this account. The password will also appear on the screen after clicking Create if sending the email is an option that will not be pursued. 10) Click Create another user if there are more to be created or click Finish if there are not. This next step assumes that your workstation already has the full Outlook 2007 or 2010 client installed on the PC. 1) Open your web browser. 2) Go to the following website https://login.microsoftonline.com. 3) Enter your credentials and click Sign In. 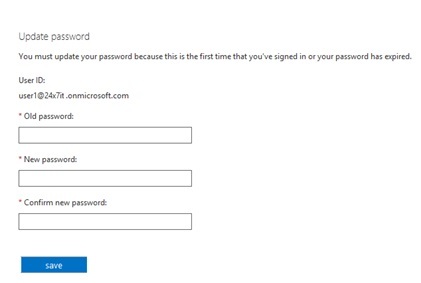 4) If this is the first time the user is signing into the account then the password must be changed. Fill in the appropriate information and click Save. 5) Once signed in choose Settings from the upper right-hand corner. 6) Next, choose Office 365 Settings. 7) If this is the first time that account is being signed into, all of the information about the account should be reviewed. This will be the information that was entered by the account administrator in Step 6 in the “Create a Mailbox” section. Once the information is verified, scroll down and click Save. 8) On the left-hand side of your screen click Software. 9) On the left-hand side of your screen click Desktop Setup. 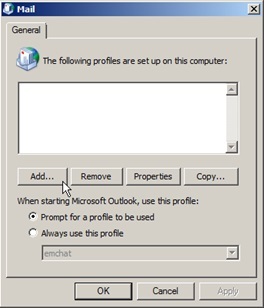 Please note, this document assumes that the full Outlook Client is already installed. 11) After you click setup the automatic configuration will start however, when prompted, fill in the password for the account being configured. 12) A setup wizard will startup. 13) In this case we will only choose Microsoft Outlook and uncheck the rest. Click Continue. In this case the Wizard has determined that Manual Configuration will be required. 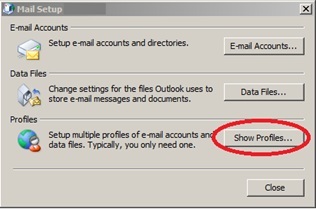 In order to complete these processes, go to the section below which covers how to connect to the full Outlook 2013 Client. Also, if this wizard fails, please see the following troubleshooting document for additional information about the issue being seen. This manual configuration can be used if the automatic configuration wizard determines your client requires a manual configuration for Outlook 2010 clients as well. 1) Open the Control Panel on the PC. 2) Double-click on the Mail applet in the Control Panel. 4) Click the Add button. 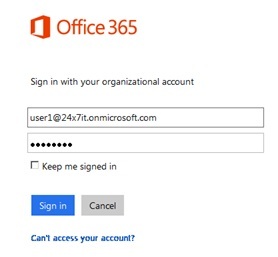 5) Enter a profile name and Click OK.
6) Fill in the information for your Office 365 account. Please note, Internet access is required for this to work. 7) Once the account and password have been verified the screen will appear as shown below. Click Finish. 8) Open Outlook to start using your Office 365 account. That’s all there is to it! You are now embarking on a journey to email in the cloud with Microsoft Office 365.